November 5, 2018 – Attendance at performing arts facilities is down from 71% to 60% according to the Access and Availability Survey. Yet, other cultural facilities such as libraries have profoundly transformed their user experience and are now reaping surprising benefits. Are there lessons to be learnt? Surely. 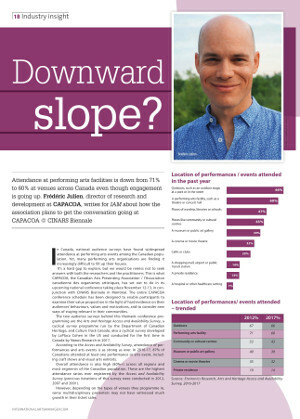 These are a few of the cultural participation trends discussed in an article in the November edition of the International Arts Managers magazine, in anticipation of the CAPACOA Conference. The CAPACOA Conference will be held November 12-13 in Montreal, in conjunction with the CINARS Biennale and MUNDIAL MONTRÉAL. It will provide many opportunities to depart from the status quo, including sessions with audience researchers, a dialogue with leaders from the library sector, a discussion on making space for Indigenous communities, as well as the Great Knowledge Café, a co-learning space jointly presented with CINARS.